Sometimes recipe ideas go horribly wrong. And sometimes really bad recipes can lead to good ones. This was one of those times. 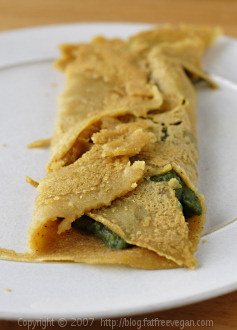 I had another “brilliant” high-protein breakfast idea–to create a crepe made of chickpea flour and fill it with a creamed spinach recipe that I used to like. So I adapted a chickpea pancake recipe by Madhur Jaffrey, omitting the Indian spices and decreasing the oil, and substituted basil and oregano for the spices in the creamed spinach. Wrong wrong wrong! As you can see in the photo below, I had to fight to get the crepe out of the pan without tearing it up, but the real problem was the filling. When I bit into it, I wished I hadn’t wasted my hard-earned crepe on this slimy, bitter concoction. It tasted even worse than it looked! So I dumped the filled crepe into the compost and began eating the remaining, unfilled one with my fingers. It was surprisingly good all by itself, with no spices or filling. I eventually got out a jar of mango chutney and ate it with that, but the nutty flavor of the unadorned crepe had gotten me thinking: If plain old chickpea flour tastes so good, why not use it to make something else? What about crackers? The next day I was back in the kitchen making chickpea crackers. The first batch I made plain, just to see if it worked. 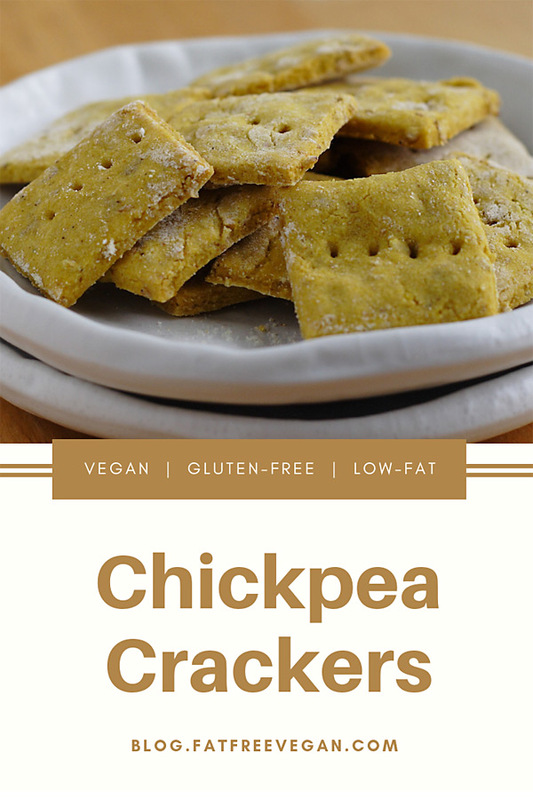 I really liked the hearty, nutty taste of the chickpea flour coupled with a hint of nutritional yeast, and something about the texture reminded me of the sesame sticks I sometimes buy in bulk at the natural food store. A low-fat, gluten-free version of them seemed like a perfect snack , so a few days later, I came up with a second cracker recipe using a little sesame oil and some toasted sesame seeds. Success! Though not exactly like sesame sticks, they make a great substitute for a treat that’s really high in fat and refined flour. Both recipes are below. 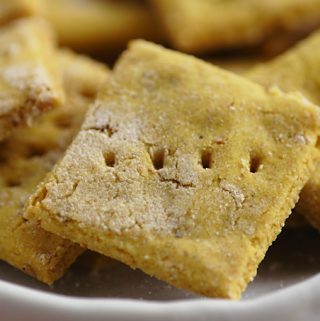 These are very dense crackers, totally gluten-free, and the all-chickpea flour version is especially high in protein and low in carbs. They’re thicker than store-bought crackers because I had trouble getting the dough thin without tearing it, but I kind of like them that way. They’re sturdy enough to hold up under the thickest of dips. I particularly enjoyed the sesame version with baba ganoush, and I think they’d be good also with hummus, though that seems a little redundant. I used a heart-shaped cookie cutter to cut these out, but using a knife to cut them into squares is actually quicker. Mix all dry ingredients together well. Stir in the oil and begin stirring in water one tablespoon at a time. The amount will depend on the moisture in your flour. When the dough can be formed into a ball, you have added enough water. (I used 4 tablespoons, but your results may be different. Knead the dough several times to distribute the ingredients, and then roll it in plastic wrap and set it aside while you preheat the oven to 350F. Dust your work area and rolling pin well with the gluten-free flour. After the dough has rested for 10 minutes divide it in half, put half on the floured surface, and sprinkle the top with flour. Roll it out until it is as thin as you can get it and still be able to pick it up. (Mine came out a little less than 1/8 inch thick or about 3 mm.) Cut it into 1×1-inch squares or use a cookie cutter. Place crackers on a non-stick cookie sheet and repeat with other half of dough. Prick each cracker once or twice with a fork (allows for air to escape and keeps them from puffing up). Sprinkle with paprika, if desired. Bake for 15-20 minutes, being careful not to over- or under-bake. Remove from oven and allow them to cool and become crispy. Test one, and if it’s not crispy, return to the oven for a few more minutes. After cooking, keep in a sealed container. If they get soft, a few minutes in a hot oven will return them to crispiness. You can increase the protein and reduce the carbs by using 1/2 cup chickpea flour instead of the other flour. Knead the dough several times to distribute the ingredients, and then roll it in plastic wrap and set it aside while you preheat the oven to 350F. Dust your work area and rolling pin well with the gluten-free flour. After the dough has rested for 10 minutes divide it in half, put half on the floured surface, and sprinkle the top with flour. Roll it out until it is as thin as you can get it and still be able to pick it up. (Mine came out a little less than 1/8 inch thick or about 3 mm.) Cut it into 1×1-inch squares or any size you want. Place squares on a non-stick cookie sheet and repeat with other half of dough. Prick each cracker once or twice with a fork (allows for air to escape and keeps them from puffing up). You can buy already toasted sesame seeds, but making them is very easy. Just heat them in a skillet or on a baking sheet in a toaster oven, stirring often, until they begin to turn golden and pop. Watch them carefully because they can burn in a matter of seconds. To grind them, put them in a mortar and crush lightly with a pestle or pulse in a food processor. Makes about 45 1x1-inch crackers. Thank you, THANK you for these recipes. I've already printed them out to make next weekend. Thanks for posting these recipes!! I am super excited as I have had some major cracker making flops lately! These look great! affects the taste and texture of the crackers? Or if it can be omitted? 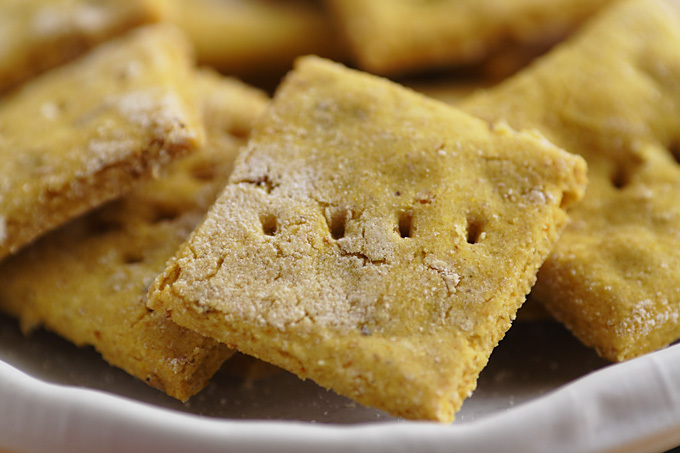 Nutritional yeast gives the crackers a savory, almost cheesy flavor. You can leave it out if you can’t find it. This recipe looks amazing, but I don’t have any chickpea flour on hand right now, would it worked the same if I used whole wheat flower? I’m afraid the proportions will be off if you use whole wheat flour. I suggest finding a recipe for whole wheat crackers and then using some of the seasonings in these recipes to flavor them. 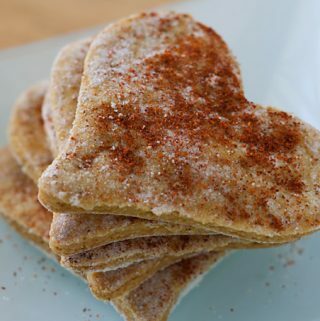 Hi – these look absolutely delicious, as well as wonderfully presented – I’m determined to try a few 1-inch sized cookie cutters to make my crackers cute little shapes like the hearts! I have a question much like Nyginko’s – I couldn’t find nutritional yeast, but have “quick” yeast, will this do? I’m glad to see it isn’t an essential ingredient. No, if by quick yeast you mean baking yeast, that won’t work. (In fact, it would make a big mess!) Nutritional yeast doesn’t have the leavening properties of baking yeast, and baking yeast doesn’t have the good flavor of nutritional yeast. You really would be better off leaving it out completely. I’m so sorry that you got sick. You’re right that some nutritional yeast flakes are not gluten-free. To be safe, I always recommend using only certified gluten-free ingredients. Bob’s Red Mill makes some nutritional yeast that is gluten-free, but only in specially marked bags. Thank you so much. My daughter has Celiac Disease and I am severely allergic to MSG. I have yet to find a great cracker for her that I can also eat (most GF crackers have soy lecithin, which has MSG). 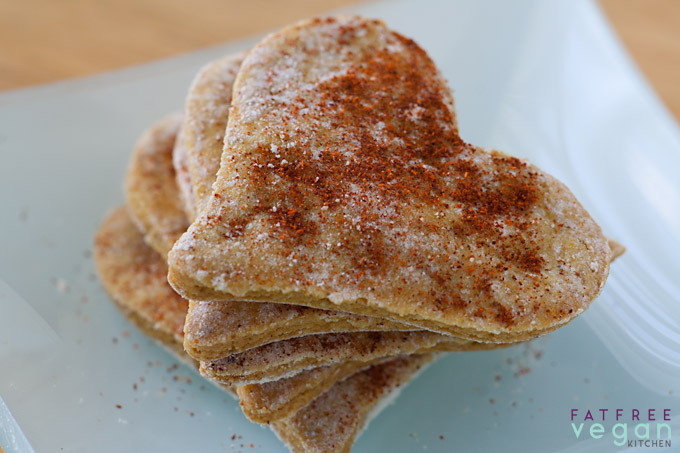 I am going to try to make these, using the Bob’s Nutritional Yeast. One caveat. Not all nutritional yeast is gluten free. Be sure it is yeast that was grown on sugar. Bob’s Red Mill Nutritional yeast is gf. These look so wonderful! I want to make some this week! I am a little new to the vegan community, so haven’t tried baking anything yet. I’m not sure where to buy the non-traditional ingredients. What market places carry these things such as the nutritional yeast and chick pea flour? Thank you! Your best bet is at a natural food store, like Whole Foods. They will definitely have the nutritional yeast and maybe the chickpea flour. If you can’t find chickpea flour there, look for it at an Indian grocery store. Good luck! Thank you for the recipes and information. My husband has progressive heart disease and his cardiologist suggested a gluten-free diet because they do not know. He is not a very willing partner in his change, which means I must make the changes without much fuss. Oh my gosh, they are beautful!! By the cute heart shapes you would never guess the chickpea goodness on the inside! It’s tough to find good gluten free crackers! My husband has discovered Dr. Crakers. They look delicious, so I thoughI would check out recipes for gluten free crackers on line. These sound delicious I think I will add seeds and nuts on top, like Dr. Crackers! I can’t wait to try them!! Thank you!!! This recipe looks great. I can’t wait to try them! Did you ever figure out how to make chickpea “crepes”? The easiest thing to do is to start with 1 cup water to 1 cup chickpea flour. Mix in flavorings (I like ~1 tsp salt and 1 tsp cumin seeds). Stir. Let it rest for 20 min. Stir and make the crepes. They are more fragile than the gluten-free crepes I make (I’ve never made real crepes), but the key is that they are also supposed to be cooked more – they need to be dry on the bottom and have some dark brown on them before you flip them. Thanks for the tips! I need to give them another try. By the way….how does one make “chickpea flour”. I assume by just grinding it in a high powered blender (I used my Vita-mix). But I just wanted to be sure. 🙂 Hubby loved them with black bean dip. That should work. I just buy it already ground. Susan…how do I get my personal gravatar on your site? Angela, go to gravatar.com and add one there. As long as you use the same email there as you do here, it will automatically show up. I made these…they are wonderful. 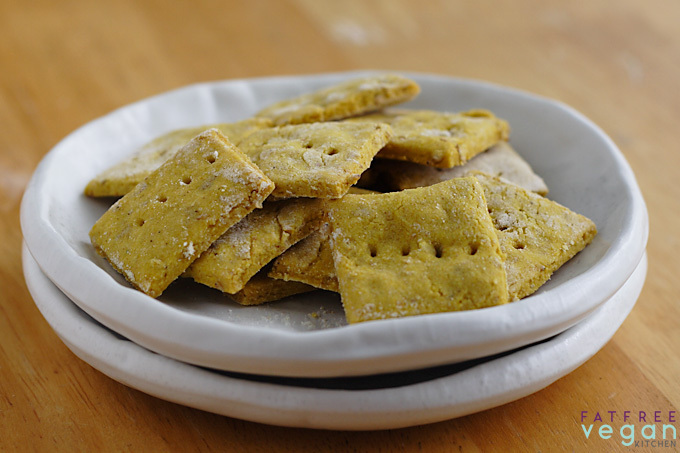 Do you have a recipe that I could use in a dehydrator for ChickPea Crackers. I tried on but I just ended up with crumbs. LOVE LOVE LOVE your site. Sorry, I don’t have a dehydrator so I don’t know. Wish I did! hi, i was wondering how many crackers are in 1 serving and what sixe would those crackers be if they were square? I happened upon your website when researching nutritional yeast. I’ve recently gone vegetarian, leaning towards vegan and was introduced to this at a Vegan cooking class. I use this stuff in so many things. Add it to spagetti sauce, sprinkle it on garlic toast, put it in my scrambled eggs. So many vegan/vegetarian dishes taste a little flat and I find NY really brings out the flavor of dishes. Look forward to exploring your website. You could bake the chickpeas and have them as snacks as they taste just like nuts. This sounds fun to try! And I laughed out loud at your comment about it being redundant to use these crackers with hummus! Wow, I want to try that chickpea crackers! Can you also use others oils except canola oil? Sure, I just use canola oil because it contains more Omega 3’s than olive or peanut oil. I have chick-pea flour at home and I never find enough ways to use it! Also.. I have been looking for good healthy crackers, but even in bio stores there is always way too much fat for my taste. So I am looking forward to trying these little guys 🙂 and if they are as good as they look then I can experiment with all sorts of spices and herbs in them. Yummy! Awesome recipes! currently fasting …probably why I am looking at food recipes…dang masochistic tendencies! Is there a way or has anyone tried doing this recipie without oil? Please let me know if so. I would love to try this but have an intolerance to yeast extract would this be different thank you s howe . I’m worried the ingredient list should also say to make sure the baking powder is gluten-free if needed. Not just the nutritional yeast. Maybe other ingredients too, but I’m not sure which others are most commonly contaminated with gluten. But baking powder is something that you definitely always have to be careful with for gluten-free. I didn’t read the whole post and may not be noticing other things like that, I’m sorry. Please just keep safe for everyone who needs to avoid gluten. If you add Cream of Tartar to the dry ingredients (not much, 1/8 to 1/4 tsp for a batch this small) it will allow you to roll the dough thinner, just have to watch it more carefully during baking and not bake as long. Also, a pizza wheel-type cutter is great for cutting up the dough quickly and cleanly. By the way, in Africa they call chickpea flour “GRAM” flour, is this the same as “Besan”?